Snacking Squirrel: Spooning is for Cereal! Made my best cereal ever this morning! And generously sprinkles with dark chocolate chips ! Question: What was the last cereal you ate? Why is breakfast soo good? This looks so good! I love how you combined cereal and oatmeal. That's a great idea to make cereal more filling! The last cereal I had was Kashi Honey Almond Flax in my yogurt mess this morning. Ooo delicious looking. It's been a while since I added cereal to oatmeal, and you're really making me crave it again. And with chocolate and bananas? Swoon. The last cereal I had was some Kashi GoLeanCrunch mixed with fruit and yogurt. Love, love. ahhh this looks so good! normally i don't go for cereal for breakfast because it doesn't fill me up - but i bet this would. never thought to make an oatmeal-cereal combo! I do love cereal for night time snacks, though. I had a bowl of puffins with banana and sunflower butter last night. Yum! I try to stay away from what I'm about to say since I am trying to put on a facade of being a classy lady, but "nom nom NOOOOOM!!!!" That looks delicious. I have my nightly concoction of a blueberry muffin toasted and crumbled up, some fruit, nuts, and dried fruit topped with cinnamon and almond milk. Toatally hits the spot after a long day! Ok this is BRILLIANT!!!!!!!!!!!!!!!!!!!!! I love it!!!!! I want this! I have to make a bowl of cereal delish like this soon!!!!! U are so creative girl! Love you and hope your weekend is great! Holy moley! How cute are those flake people!!!??? I'm still in awe! My cereals are sooo plain compared to yours. You are super creative! I just have plain ol' mini wheats (blush). Have a fantastic weekend, dear! Oatmeal with honey kix, diced apple, strawberry preserves and peanut butter on it. Last night for a treat! I love layering cereal and fruit on oats! Perfect! Oh, that looks really good! I feel like a novice. My last was Honey Bunches of Oats with almond milk and cinnamon. Yours looks yum. Def want to branch out heh. I love mixing different cereals with each other or with oats. I had a bowl of Newman's Own Wheat Flakes this morning, with rice milk, sunflower seed butter, and fresh blackberries and peach slices. Today I went to the super market to buy cereals. After half an hour of giggling with the cashiers and the guys at the veggie part, I bought some purple pasta, 3 types of jam, a pair of golden flip flops (!) and of course I forgot the cereals! Oooh yum, this looks delicious! the last cereal i ate was ages ago..other than oats if that counts. those mini dark choc chips look fabulous and your comment last nite, thank you for the intelligent insights and musings and ponderings. comparing a certain amt of blog success to celebrity..all of a sudden strangers feel they know you and can stalk you...oh yes, indeed. It's such a surreal thing! Anyway honey, enjoy the weekend! wow, some seriously good cereal. I haven't had cereal in ages either. usually just oats. But we used to get nature's path pumpkin flax. So good! It sure looks yummy:) I don't really eat cereal, so it was a while ago. YUM! best combo ever!! i need to try that banana cereal. the addition of dark choc chips was perfect! LOVE the chocolate chips ! They are the BEST addition to cereals, oatmeal...etc. Oh...and the last cereal I had was recently - um, Puffins! Your breakfast looks so good! It kind of reminds me of this banana split oatmeal that I made once upon a time, except it used overnight oats, chocolate amazing grass, coconut, and no cereal! Okay, so it was pretty different, but it still had oats, banana, and chocolate...and um, that's a killer combo! Other than oats, I've had lots of raw granola. I'm not sure about any other cereals..haven't had them in years. Most of them are not gluten free and once I tried a GF one and it was kind of funky...so I stick to grawnola (which is awesome). I kind of miss Nature's Path granola sometimes. That stuff is pretty addictive. Love the picture of the milk soaked cereal!! I don't eat a lot of cereal, but one of my favorite things to eat is a banana - chilled in the freezer for about 10 minutes, then rolled in Kashi's Go Lean Crunch! Seriously, I adore your photos. I don't know whether it is the food or the pictures that I am in love with. For some reason, I cannot remember the last cereal I ate... that is weird. looks like a delish breakfast! i'm completely an oatmeal girl all the way. i had muesli this morning with oats, peaches, almond milk, yogurt, and walnuts..delish! WOW. I am bookmarking this just so I remember to make this for either brek or a snack! The last cereal I ate (other than oatmeal) was Kashi GoLean. The honey almond flax kind- love ittt! Oh my word!!! That cereal looks WONDERFUL!!! Just the other morning I had some oatmeal with chocolate pb spread and choc. protein powder mixed in! sooooo good!!!!!!!!!! Nature's Path cereals are the best, I have never had the one you used in this bowl, ill have to keep my eye out for it! I hope you are having a fabulous weekend! That looks insanely delicious! How did you do that picture of the cereal-people. I love it! Cereal and oatmeal are amazing together. How did you make the little cereal people picture? That's the cutest thing I've seen! But as for cereal, I sometimes add the GF Peanut Butter Puffs to my yogurt, but I don't eat cereal that often. I do not like cereal in milk- only dry, weird?? I don't eat cereal very often, but I forgot how easy it was! Guess i should start again! It's been too long since I've had cereal! I'm on a eggs/cheese/veggies/potatoes-for-breakfast kick right now! I think the last bowl I had was filled with Puffins + banana + almond milk. I love the chocolate chip addition! I would eat cereal EVERY morning if they were in the mix! Hope you're having a wonderful weekend, Kelsey! oh my gosh, that cereal does look amazing! I wish I had some Count Chocula right now! talk about YUM in as bowl!!!! Whoa whoa WHOA! This cereal is outta control. Totally just had a foodgasm. Seriously, it looks SO good! I really enjoyed my Cornflakes this am, but your bowl of yumminess totally puts it to shame! That cereal looks delicious! I need to add some of the goodies you've included to my morning routine. Mmm I had Fruit Loops this morning :) It's my cheat day, don't judge me! Hehe! Ah. Kelsey. Now you're talking about spooning! Could it be the gluten still making your hormones cheeky? LOL. I love your little cereal people! 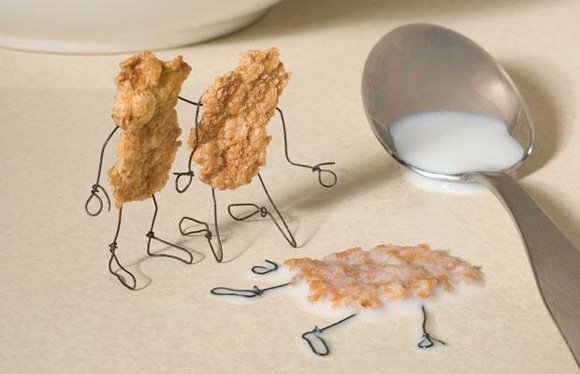 Hahahahha - I love the cereal people!! I cannot remember the last cereal I ate - crazy! Wow I need to try this! It looks incredible! Last cereal I ate was probably PB Puffins... but that was a long long long while ago... and I want some of yours! Sheesh! It looks so good!